This is an entrée salad if I’ve ever seen one. And it’s what I’ve been noshing on lately for solo-lady dinners and lunches at home. It makes delicious use of seasonal vegetables, my favorite 5-Minute Macadamia Nut Cheese, and my 10-minute Chimichurri as a dressing! Wowza – that’s a gorgeous plate. Let’s make salad! I’ve been digging roasted vegetables lately because they’re the easiest way to make vegetables tender, delicious, and easier to digest. And even with the roasting time, this remains a 30-minute recipe. Some of you ask how I work so fast in the kitchen. I suppose I’ve been doing it for a while now, but also, I multitask! While your veggies are roasting, make your dressing. It’s that easy! Lately, I’ve been throwing whatever roasted vegetables I have on a bed of greens and calling it a meal. 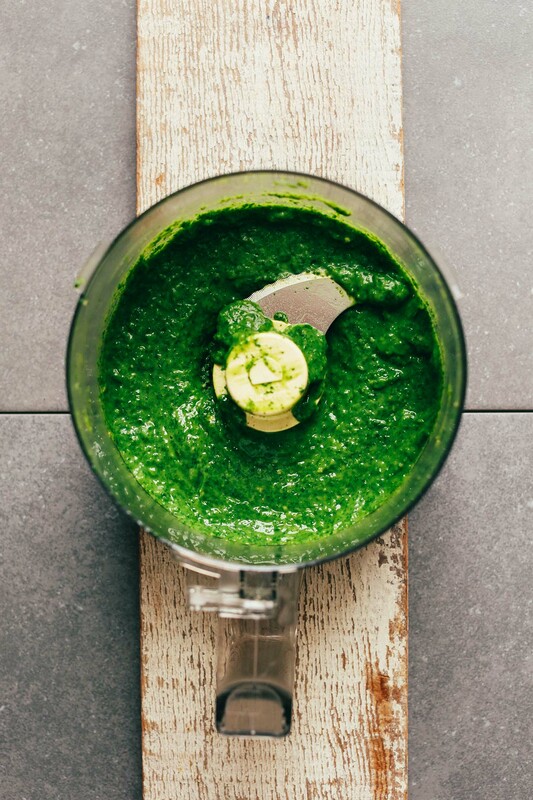 Add a little tahini and lemon juice for “dressing.” Or, if you’re feeling fancy, bust out the chimichurri – my new favorite condiment for summer! 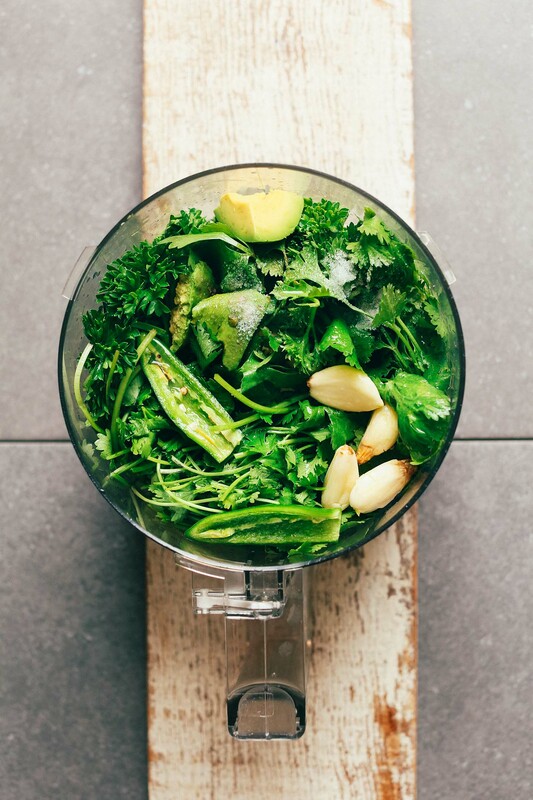 Not only is it a gorgeous, vibrant green color, but it’s packed with healthy fats, spices, and an extra serving of greens from both parsley and cilantro. Hello, world’s healthiest dressing (cue waving hand emoji). This would make the perfect meal for an easy at-home lunch or quick weeknight dinner. It travels well, so I could also see it being delicious on picnics, hikes, road trips, or even plane trips! It’s hearty enough to serve two as an entrée (20+ grams protein!). But it would also make a delicious side to meals like my Grillable Veggie Burgers, Zucchini Lasagna, Chickpea Sunflower Sandwich, or Red Lentil Chili. For more of my favorite salads, check out our Garlicky Kale Salad with Crispy Chickpeas, White Bean Kale Salad with Tahini Dressing, 20-Minute Asian Kale Salad, Sweet Potato Chickpea Salad, Roasted Sweet Potato Avocado Salad, Blissed-Out Thai Salad with Peanut Tempeh, and Thai Kale Salad with Curried Chickpeas. If you try this recipe, let us know how it goes! Leave a comment, rate it, and don’t forget to tag a photo #minimalistbaker on Instagram so we can see what you cook up. Cheers, friends! 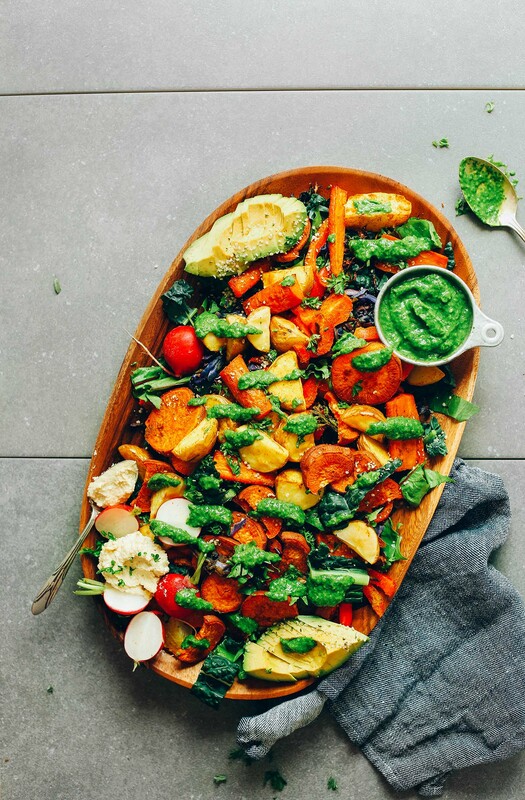 30-minute, colorful roasted vegetable salad over greens with macadamia nut cheese and chimichurri dressing! A satisfying plant-based meal or side! Preheat oven to 375 degrees F (190 C) and line 2 baking sheets with parchment paper (fewer or more baking sheets if altering batch size). 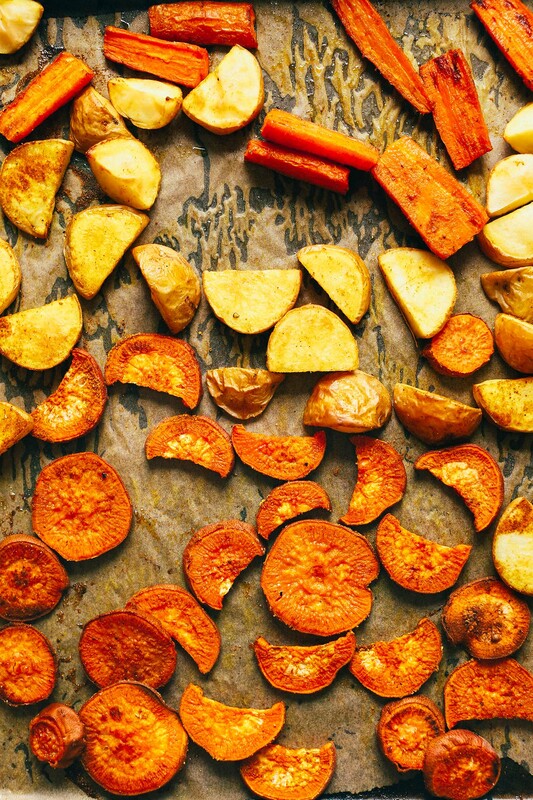 Add the sweet potato, potato, and carrots to one baking sheet and toss with half of the oil (or water), half of the curry powder, and half of the sea salt (as original recipe is written- 1 Tbsp (15 ml) oil (or water), 1 tsp curry powder, and 1/4 tsp sea salt). Bake for 25 minutes total or until golden brown and tender. To a separate baking sheet, add broccolini, cabbage, and bell pepper and toss with remaining half of the oil (or water), half of the curry powder, and half of the sea salt (as original recipe is written- 1 Tbsp (15 ml) oil (or water), 1 tsp curry powder, and 1/4 tsp sea salt). Bake for 15-20 minutes total or until golden brown and tender (place in oven once the potatoes have been cooking for 5-10 minutes. In the meantime, make chimichurri. Place garlic and pepper in a food processor along with the cilantro, parsley, avocado, salt, lime juice, and maple syrup. Process/mix until smooth, scraping down sides as needed. Thin with water until a semi-thick (but pourable) sauce is formed. Taste and adjust flavor as needed, adding more pepper for heat, garlic for spice/zing, avocado for creaminess, salt for saltiness, lime for acidity, or maple syrup for sweetness. Transfer to a serving container. Leftovers will keep covered in the refrigerator up to 4-5 days. Be sure to seal tightly or the sauce will lose its vibrant green color. 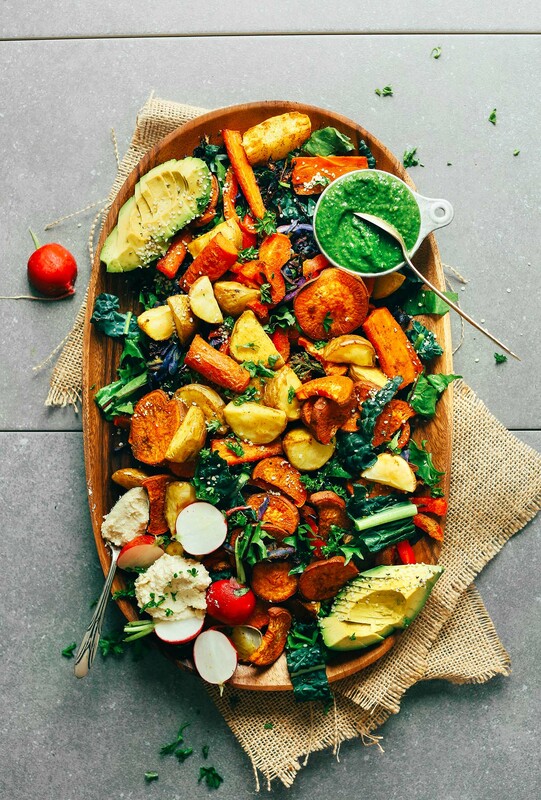 Plate salad by adding mixed greens to a serving platter and topping with roasted vegetables. Arrange avocado along the edges, along with radishes and macadamia nut cheese (optional). Sprinkle the top with hemp seeds and serve with dressing on the side. Garnish with herbs if desired. Keep undressed leftover salad covered in the refrigerator up to 3 days. Eat cold or at room temperature, or reheat on the stovetop (it will cook the greens, so it becomes more of a vegetable scramble). *Nutrition information is a rough estimate calculated with all of the dressing. I think this salad is a ten. It is filling, beautiful and rich. I didn’t feel disappointed at all that this was my main appy and dessert for Sunday dinner. Amazing. I will be serving it at our dinner clubs. Truly awesome! This was pleasantly wonderful, made this for a meat loving friend and he didn’t even notice the lack of protein. Will definitely be making this again and. The chimichurri was especially fabulous! I was looking for some meal prep inspiration when I stumbled across this recipe. I made the roasted vegetables and chimichurri with a small portion of baked chicken (we’re plant loving omnivores) it reheated so well, it was amazing to have something in a reheated lunch taste so bright and fresh. 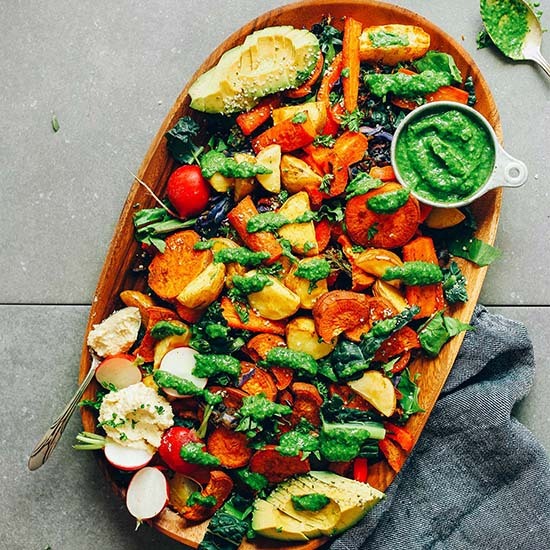 This chimichurri sauce is on point and perfect for dousing all of my roasted veggies (and even tofu)! I appreciate the use of avocado instead of all the oil that’s typically in this sauce. Thanks for another great recipe! I made this tonight and thought it was great! As someone who enjoys cooking, I’d say this was a very fun recipe to try (and bonus points that it’s not insanely complicated or time-consuming). It’s pretty, colorful, and healthy! I plan to reheat it at work a few days this week, so I hope it holds up moderately well. I love that it has a big variety of vegetables, fresh greens, and still includes some potatoes and sweet potatoes to make it a little more hearty and filling. Thanks for a great recipe, I’ll definitely be making it again! Is this intended to be a warm salad? I’m trying to decipher if I should roast the vegetables in advance for guests tonight, or if I should time my cooking so that the vegetables are still warm. Better to have cold roasted veggies on the salad, or warmed from roasting? We made this last night and it was so flavorful and fresh tasting. Served it with the portobello mushroom recipe. TOTALLY DELISH!! THANK YOU!! This is a really easy and delicious dish! The chimichurri sauce is AMAZING. I’ll be doubling the batch next time to use on other things. I made this. I used cashews for the “cheese” it’s the first time I’ve made/eaten a nut cheese. I ever let me traditional cheese so I was skeptical. But this is so good and easy to make! I just wanted to thank you for a great dish! I am trying to eat healthier and I like vegetable dishes to be bold and flavorful. This dish certainly hits both points for me. The medley of flavors were both interesting and delightful. I will certainly try other recipes on this site. Thank you Dana. We used this sauce to replace a Cooks Illustrated chimichurri recipe. I used 2 Mama’s Lil Pepper Slices rather than jalapeño. No need to keep fresh jalapeños around! Really excellent! This was the best recipe I’ve made in SO LONG!! Everyone left feeling full, delighted and satisfied. And so healthy! I made this tonight and altered it to be oil free as well! The macadamia cheese was unbelievable and my first foray into that style of vegan cheese. The veggies and dressing along with the potatoes all came together beautifully. Served with your creamy asparagus soup! Yum! SOOOO good! Omg best salad I’ve had in a long time. I find having a good vegan salad dressing is difficult because I don’t want to use too much oil. But this is perfect and amaaazing! I made it with half a serrano pepper (no stem or seeds) and my mouth is on fire, but I’m not all that good at dealing with spicy foods, so I’m glad I only started with half. I don’t usually cook with hot peppers, but this is amazing, tastes so good! Very yummy! So bright and hearty. It’s my favorite roasted veggie dish, so far! I loved this one…perfect for salad eating in the cold…I used pistachios, cause that’s what I had and roasted mushrooms and beets to add. I didn’t have Curry, so used garam masala and it was yummy. Thanks so much for helping me to be vegan. Great recipe, but I agree with a few commenters with the prep time. It also took us about an hour to chop everything. I made this recipe for Thanksgiving for those who don’t eat turkey. It was a hit among them AND the meat eaters. All of those wonderful colors and the incredible array of flavors made this a requested dish now in our family. Thank you! I made this and it was amazing! Husband said I could make this for omnivore dinner guests, that’s the highest rating my cooking can get. I didn’t make it with curry as we are still learning about those flavors, but used lots of garlic instead. Still incredible and delicious! I made this tonight, and its’ so, so good. I’m always a fan of roasted veggies, but that sauce is amazinggg. It makes the dish. Also, I didn’t have parsley for the chimichurri, so I used raw kale in its place—A+. I agree, the Chimichurri sauce was so good. This is a go to sauce. It blended perfectly with the roasted veggies. Big Hit! I made this for dinner earlier this week and it was a huge hit. However, the chimichurri sauce and the cheese really made my day. Today I made the chimichurri sauce with less heat and added about a third of a cup of watercress to bump up the nutrient density, left out the salt and used 3T raw pumpkin seeds instead of avocado as that was all I had. It’s now my go-to salad dressing. It’s absolutely delicious on an Eat-to-live compliant salad. Okra is a splendid addition to the salad, btw. I put it into my air fryer at 370 for 15 min and then add it to my salads. Delicious but took me 3 hours! There is no way you could make this in a half hour. We made this last night. Although it was tasty, we were too angry about the prep time. We were chopping vegetables for an hour. No idea what you were talking about with the 5 minute prep time. It took that long just peeling the potatoes. Thanks for the recipe. We’ll make something less time consuming from your blog next time because you do have some great stuff here. This was so good! This would be great on its own as a meal, but we had it with salmon. The roast veggies and potatoes mixed with the greens were awesome. The chimichurri and macadamia nut cheese were the perfect combo together (I used cashews instead of macadamias). Thanks for another awesome recipe, will be making this again! Omg i saw tomatoes and not potatoes, i am the worst. Another excellent recipe!! We paired it with your green chickpea curry for a fabulous vegan dinner. Thank you! Made this for a lonesome weekday lunch, perked me up to have something so full of flavour and interesting over my normal hummus and veg. Very healthy too, which baby bump and I fully appreciate. This is such a great salad! The ingredient ratios and cooking times are just right. I didn’t have red peppers so added a few mushrooms instead. The chimichurri is the perfect dressing for this salad. It came together beautifully in my Vitamix. The leftovers will make awesome packed lunches for work. I made this last night and it was amazing! I didn’t have parsley or curry seasoning so I subbed extra cilantro and some cumin and creole seasoning. So full of flavor. The only mistake I made was deciding on my own to add balsamic to the greens. So unnecessary and distracting from the chimichurri deliciousness. I can’t wait until lunch for leftovers. I made this tonight, and like all of your recipes, I loved it. The macadamia cheese was great too, I realized I need a good food processor, the vitamix leaves too much in the bottom that I found hard to scrape out. The constancy of the cheese makes for a perfect spread for crackers etc. So I found a few recipes here that I can add to other meals. Thanks Again for the great dinner. Eating the chimichurri on greens and garbanzo beans right now, delish!! Will be having the roasted vegetables and salad with chimichurri M-W for lunch. Thanks Dana for all of your great recipes. I am not vegan or gluten free but find myself believing I could be after making several of your recipes and being amazed at how fantastic they taste and are so easy to make. my wildland firefighting son is vegan, but is having a hard time staying vegan while on fires. he has 2 days off and i served him this tonight, a big hit! thank you. Marianna i am thinking your son îs struggling when on fires due to options on offer. As a disabled vegan who does not always have the use of my dominant hand I have taken to combining hot and cold foods and really enjoy it. My beloved haș even followed suit. I will top a salad with hot grains, potatoes, soup, chili, beans, noodles…pretty much anything I have. Or if I am not up to warming anything I will just eat everything cold. I find many things, especially all things tomato based are excellent cold. Your son may be faced with animal-centric mealtimes while on fires. Even then I imagine they still might serve potatoes, grains or bread and șome sort of veggies. Even if he haș to keep a ziplock of B12 enhanced nooch in his gear to add. While I am sure it îs a struggle I hope if it îs important to him he îs able to find a way to make it work. Please send my gratitude to your son for doing such a hard but vitally important job. yes, his options are limited., and he’s gone anywhere from 2 to 3 weeks at a time. there are vegetarian options. that can translate into tons of bread and cheese. and sugary foods like candy. they have to get up to 6000 calories a day. but i’m thinking he’s grateful to be back home and eat as he pleases, vegan. and i indulge him as long as he comes over for dinner. i am so thankful for sites like this one that help get me inspired and out of my rut. So yummy! I definitely love my roasted vegetables, and I constantly heat my veggies up to make them more flavorful! The chimichurri looks so good and was amazing! Outstanding job, Dana! Perfect weeknight dinner loaded with healthy and colorful veggies. This is going to be a regular in my kitchen now. Yay! Thanks for sharing, Ranjana! Made this tonight and it was so satisfying after my workout! The sauce is absolutely amazing. Thank you for another great recipe! Love this recipe except… not a big fan of curry! Any other spice(s) I could use instead?? Really any spice blend, even a mexican would work: garlic, cumin, chili powder/cayenne, paprika. Or, just salt and pepper and a little cinnamon could be nice! Your recipes have helped me convince teenage boys to eat vegan. I made chimichurra exactly as written, “cheese” with cashews, roasted veggies on two pans as suggested. Now that’s a compliment! So glad everyone enjoyed it! Made this for dinner tonight! It was so good! Loved the mix of cooked and uncooked mixed together and the chimchurri sauce was so good! This looks amazing. I can’t wait to get it in my belly. PS: I’m allergic to cilantro ( but not parsley, I know weird) . Is it okay to just leave it out or do I need to add something to balance the flavors? Yeah! Use all parsley. Or even mint or basil would be nice. What a gorgeous salad! I’ve been making lots of your recipes recently and I can’t wait to make this one. The chimichurri looks so good–oil-free, yet filled with good fats? Outstanding! Thank you, Dana. Yes! That was intentional. Hope you enjoy it! My boyfriend is allergic to nuts so I often sub with seeds whenever you call for dry nuts or nut flours in recipes (as I’m also gluten free and vegan). The one I’m stuck on is making nut cheeses, would they work with sunflower seeds or pumpkin seeds? I love expanding my protein options and am realllly craving something cheese like :) Thanks again for all of your inspiring recipes and helping to show the world that eating healthy can be quick and tastey! Hi Sarah! I haven’t tested them that way, but I’m guessing sunflower seeds or hemp seeds would be your best bet! Che artisan is a vegan cheese brand that makes sunflower seed cheeses. They’re awesome! This chimichurri sauce is so good, I’m not even bothering to dream up something to put it on! Thank you SO much!! I would love to make this chimichurri but I’m not a fan of avocados (I know, a vegan who doesn’t like avocados. I also don’t like mushrooms…..) Anyways, can I sub anything for the avocado, or just leave it out? I pretty much eat a bowl of green/grain/bean/veg every day and am always looking for new dressings/sauces. I am allergic to avocados so I would like to revisit this question and see if there is, in fact, anything I could sub for the avocados in the Chimichurri. Add olive oil instead… ?